Wheat Ridge Sanitation District was founded in 1948, and now includes over 6,000 customers. We are not part of the City of Wheat Ridge or part of any water district. 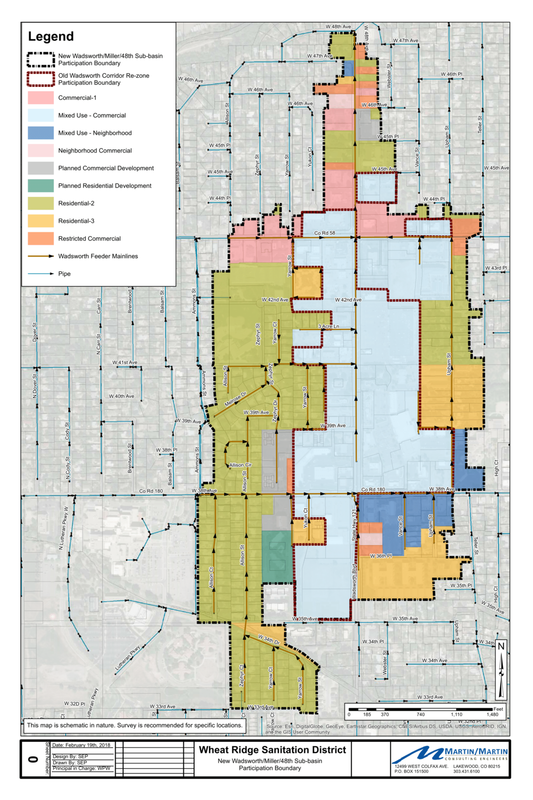 In fact, five different sanitation districts include parts of Wheat Ridge in their boundaries. We collect sanitary sewer only (sinks and toilets). We do not collect storm water runoff, nor do we collect trash. Our sewage is treated by the Metropolitan Wastewater Reclamation District. We are responsible for maintenance, repair and replacement of the sewer main lines located in streets and alleys. An elected, five-member Board of Directors governs our District. For more information, please see our 2019 Wheat Ridge Sanitation District Transparency Notice. Regular meetings take place the second Tuesday of each month at 2:00 PM at the District office located at 7100 W. 44th Ave., Suite 104 Wheat Ridge, Colorado 80033. To view the current Wheat Ridge Sanitation District Board Members, please click here. For information on the Districts budget and boundaries, please click the appropriate button from the Colorado Department of Labor and Affairs (DOLA) below. Hours: M-F 8:30 a.m. to 12:30 p.m. Locate utilities BEFORE you dig!